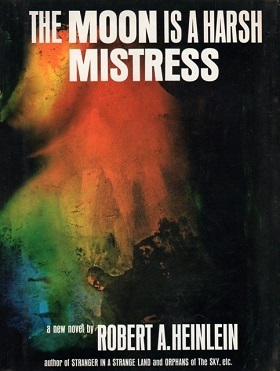 I just finished Robert Heinlein’s 1966 novel The Moon is a Harsh Mistress. I was bound to like it as it’s warmly embraced by the individualists and libertarians, even winning a Prometheus Award. (Did you even know there were awards given to science fiction books that include libertarian themes?) Heinlein, for those who don’t know the so-called Dean of Science Fiction was a well respected author in a genre that isn’t always all that well respected. Mostly, I read three kinds of books. Non-fiction books, ‘fine’ literature (or least somebody calls it literature), and science fiction. Science fiction is the cheesy entertainment stuff in my repertoire; my ‘guilty pleasure’. What I have been unable to find time for are popular, young adult series that seem to be so popular these days. I’ve not read more than a few pages of the Harry Potter series (even stopped watching the movies), the Twilight books (haven’t even seen the movies), or the Hunger Games (quite liked this movie, actually). I can often be heard wondering out loud why people bother with these books. and the response is almost always something like; it’s just entertainment and hey, it’s better than watching TV. It seems to me there is so much amazing writing out there, and reading takes so much more effort (well, for me at least) than passively watching a movie for an hour and a half that reading these simple and predictable books is a poor investment in time. And stop picking on TV; just get a streaming service already. But, mmm, all this seems a bit hypocritical, for a guy who’s often reading sci-fi. I was forced to defend myself while reading this last book. Without having read the Potter novels or anything like them, I really can’t justify this artificial distinction I’ve made, but I can at least describe what I found special about The Moon is a Harsh Mistress. Moon is a science fiction novel set during a war of independence for a lunar colony in 2075. Some writers choose a science fiction or fantasy setting to let their imaginations run free and create new worlds for us to explore, while others use these outlandish settings as allegories for a moral that could have been placed anywhere. What sets Moon apart is that Heinlein manages to deliver his message of individualism and the virtue of choice versus the sin of forced taxes and government control without letting it simply rest on an interesting, but unnecessary, infrastructure of lunar exploration. Instead, his ideas are inseparably linked and woven into this story; supported by the science and physics of the environment. The revolutionaries in Moon share themes and ideas with any story illustrating the same conclusions, but the action could only play out as it has in this exact and rare relationship between the Earth and it’s unusually large satellite. These details, combined with the greater themes gives the novel unexpected depth, for it can be read as an adventure story of the early years of lunar independence or as a treatise of individualism and its political requirements and ramifications. Is Moon literature? I doubt it. It already feels a bit dated, and Heinlein’s writing can easily grate on former English majors or anyone who is uncomfortable with the status of gender roles before the 70’s. Heinlein, by the way, is notoriously progressive in his views of gender roles, and sexuality. Moon is certainly no exception, but he also manages to show enough objectification and stubborn biases to make a feminist’s skin crawl. If it doesn’t put you off completely, it’s frequently humorous quirk of his writing. Without reading them, I can’t really say that Rawling’s Harry Potter novels, or any of the others, don’t share this same depth, but any book that can so successfully sneak such fascinating themes into an otherwise just-plain-fun entertaining story, complete with a riddle telling, sentient super computer, is worth recommending. So, “Why is a laser beam like a goldfish?” “Because neither can whistle.” Not that funny, but not bad for a recently sentient super computer who had never seen a real goldfish.